Every time I post a video or a snap I have a handful of people asking about my skincare routine which is super flattering because that means you guys think I have good skin haha. So thanks! Anyway.. I did a mini snapchat walk through of my products for day and night and you guys loved it so I thought I would bring it to the blog. I hope you like it! 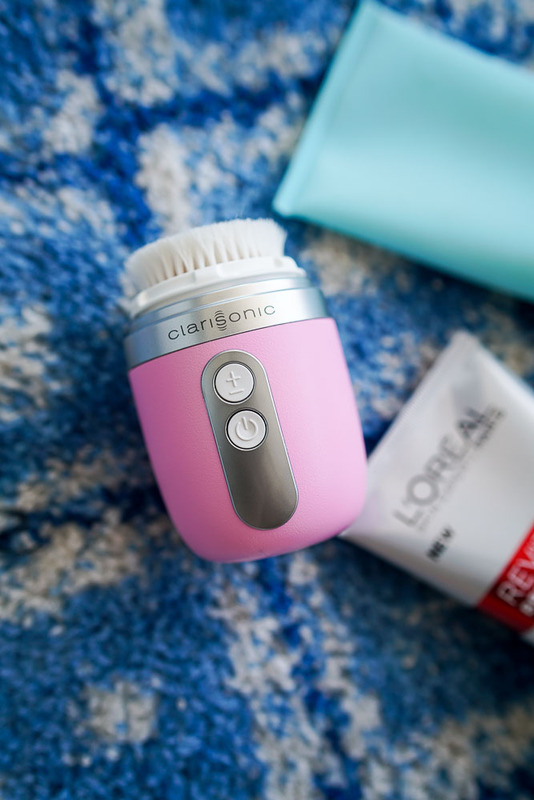 Clarisonic Mia Fit (ON SALE): I've been using this for a couple weeks now and I totally love it. I feel like its one of those things you never really knew you needed. I hate to wash my face and this just makes the whole thing easier. It lets you know how long to spend in each section, gets the dirt and oil out of your pores and it's really easy to use. 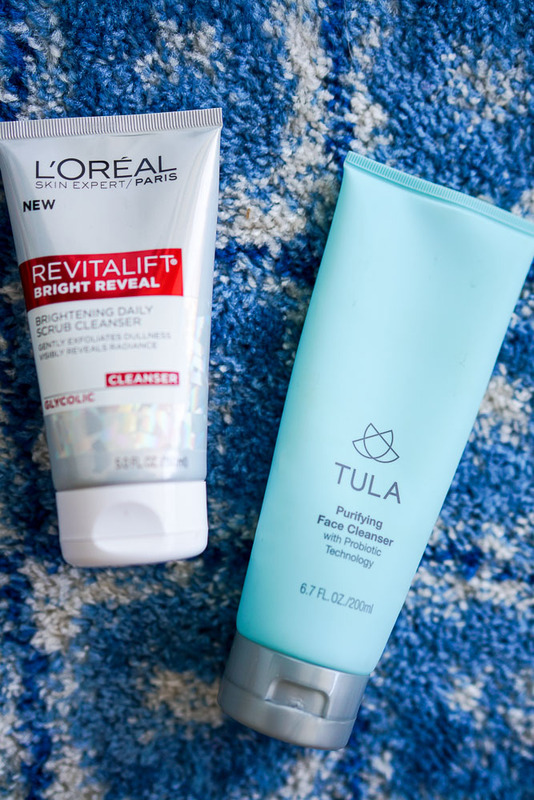 Face Wash: For face wash (I use these at night and in the morning) I'll switch it up between the L'Oreal Revitalift and the Tula cleanser. I love both of them and they both do different things for me! The L'Oreal one has really fine exfoliating items inside that make it great for when I really want to clean out and it does to a great job at brightening my skin. The Tula cleanser makes my skin feel so soft and really helps my skin balance out. 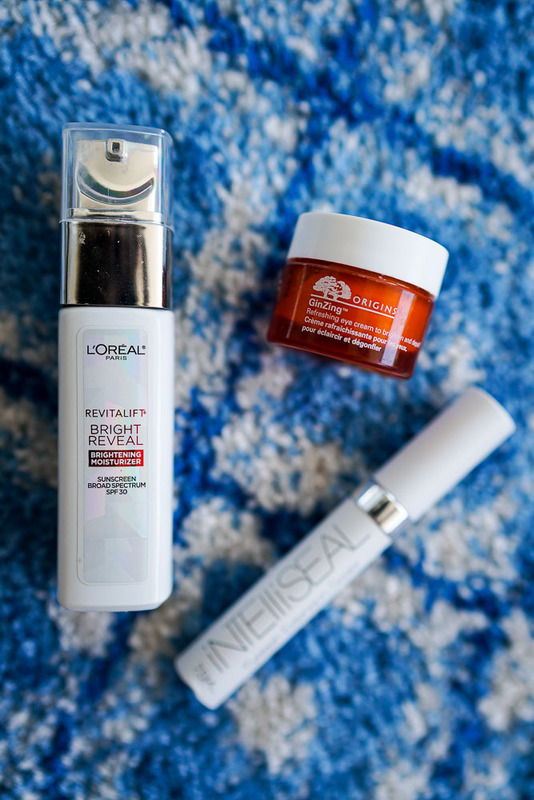 L'Oreal Revitalift Moisturizer + SPF: So I'm totally crazy when it comes to my skin moisturizer because everything gives my acne, makes me break out in a weird rash or just completely makes my skin super oily (aka I have really weird + sensitive skin). But I've found that this works really well with my combination skin. But what I really love is the SPF in it. I ride my bike a mile+ to work every day along the water and having daily skin protection really means a lot to me. This stuff is the best! Origins GinZing Eye Cream: I've loved this stuff (and have been using it) for over a year now (see proof here) and there is just no quitting it. It has some brightening things in it so it literally is like highlight for your under eye while it's helping give it moisture and zapping away the dark circles. It's my holy grail item. Intelliseal Eyelash Sealer: I talked a TON about this in my eyelash review and Q&A but this stuff gets put on daily so my extensions don't fall out. It's the bomb dot com. 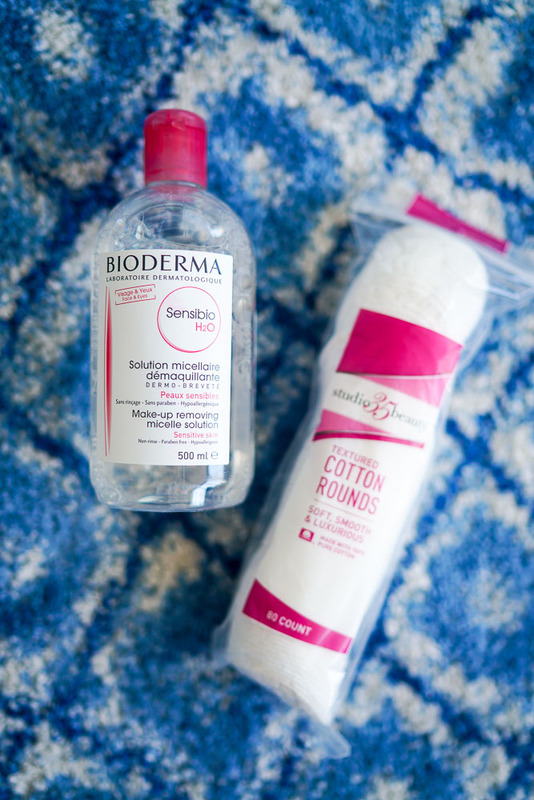 Bioderma Sensibio H20: I've also talked about this product a lot before on snapchat but this is THE BEST at getting off your makeup or just simply getting rid of the dirt from your face after a long day. It doesn't leave any weird feeling on your face like most makeup removers do after you use them which I love. It honestly is like magical water and I l-o-v-e it. I use them with generic cotton pads from the store! 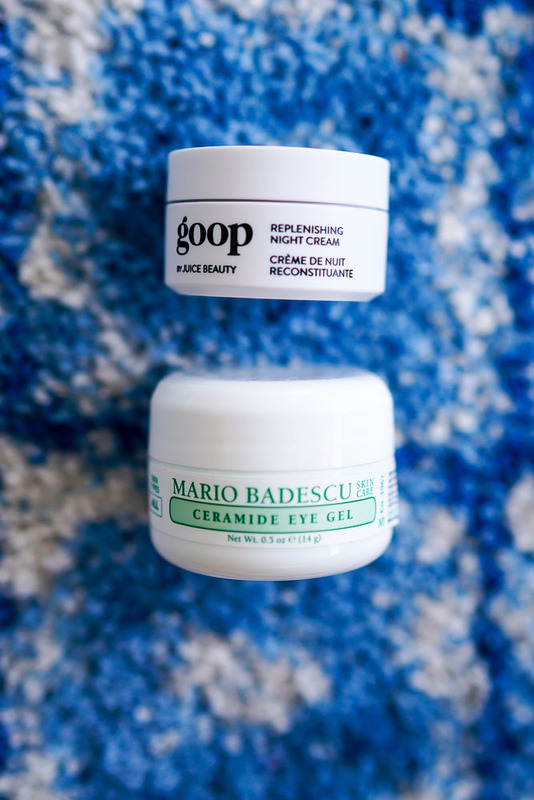 Goop Night Cream: This stuff. Gah. I love it. It's SO thick and creamy that it just gives your face that extra needed moisture overnight. I will even wake up in the morning and still feel it on my face so that means I could have gone even longer with it on and it would still be working it's magic. It also smells SO good and feels amazing when you put it on. Mario Badescu Eye Gel: They're not kidding when they say gel because when you open this sucker up it looks like aloe! I love to use this at night because it stays really gel-ly on my eyes and I feel like keeps providing moisture over night and all night when I sleep. I also really love Mario Badescu items, I think you can't go wrong with anything in that line! So that's it! Let me know if you guys like posts like this because I can of course do more in the future. I haven't done a beauty post in forever but since I got so much love and feedback from my mini snapchat story, I thought it would be fun to share with everyone! I also want to do a post about face masks if you're up for it. Let me know! Taking notes because my skin hates me and breaks out with most of the stuff I try! The Clarisonic is a magical thing. And yes please to more beauty posts! I use Bioderma too! The best at removing my makeup at the end of the day! I'm absolutely obsessed with my Clarisonic! If I skip a day of not using it my skin breaks out so much! I ordered the Bioderma after you first mentioned it (a tiny little bottle to test!) because I have ridiculously sensitive eyes and I can't handle anything that is remotely oily. This stuff is a dream! Thank you for recommending it! Love your post, especially since you actually use these items and can give honest feedback! Ethereal Ageless Skin Serum Sunscreen should be applied to the face with a sponge applicator. Using the sponge ensures deep and even coverage of the sunscreen. 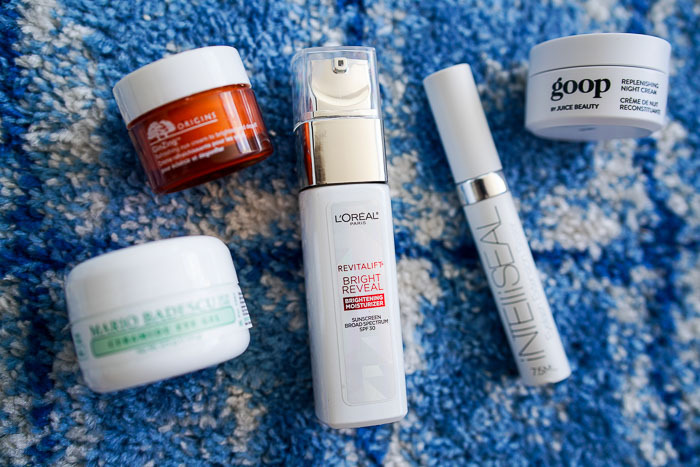 This will help your face to feel less greasy with the sunscreen on it.